An international team of researchers has uncovered a multitude of new driver mutations in lung cancer cells that may be responsive to genomically targeted and to immune cell therapies. “We have identified several distinct recurrent mutations that are likely to be recognized by the immune system and therefore would be strong candidates for cancer vaccines,” explained lead study author Joshua Campbell, Ph.D., a postdoctoral associate at Broad Institute of MIT and Harvard. The team of researchers examined 1144 genome profiles of cancers from patients with two of the most common types of lung cancer—lung adenocarcinoma and lung squamous cell carcinoma. The investigators were able to identify novel driver mutations that affect the activity of several proteins responsible for signaling in cells. In this study, the research team used statistical methods to distinguish likely driver mutations from the so-called passenger mutations that occur during cancer development, but do not provoke tumor growth. Overall, the scientists detected 38 significantly mutated genes in lung adenocarcinoma and 20 in lung squamous cell carcinoma. However, only six mutated genes were shared by both types of tumors, suggesting that, although both types arise in the same organ, they differ quite significantly from each other. Interestingly, the comparison of discovered genome variants with the other 19 cancer types has shown that lung squamous cell carcinoma is more similar to head and neck tumors and a subset of bladder carcinomas than to lung adenocarcinomas. Additionally, the research team identified several predicted neoepitopes—protein fragments that may be recognized by the immune system and serve as markers to detect and fight cancer—in most cases of lung cancer. 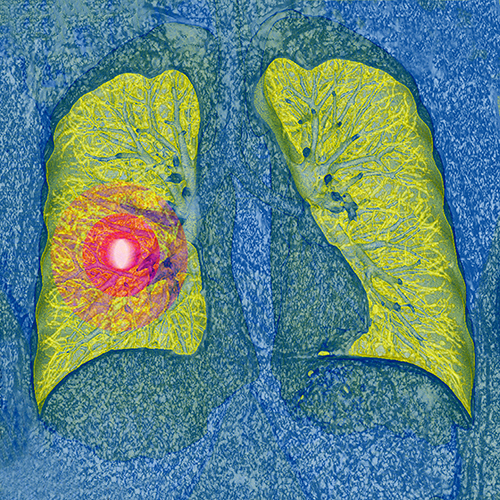 Consequently, 47% of lung adenocarcinoma and 53% of lung squamous cell carcinoma samples have at least five predicted neoepitopes, suggesting a significant potential for immunotherapy, which is aimed at harnessing the patient's immune system. Previous research assumed that primary driver mutations were similar between lung adenocarcinoma and lung squamous cell carcinoma. The new study, however, indicates that the underlying cell type is a key factor in determining whether or not the mutation causes cells to growth and multiply uncontrollably.